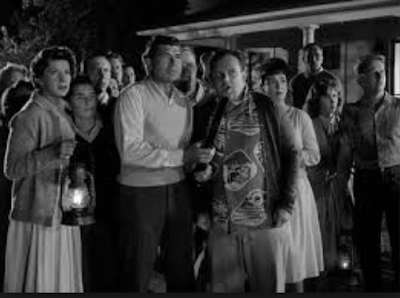 “The Monsters Are Due on Maple Street” appeared on TV in 1960 as an episode of the series of “The Twilight Zone”. The author of the film Rod Serling was one of the most successful TV-producers in the USA. The film began with a peaceful scene of life in a small American town. The inhabitants were busy with everyday deals when something like a meteorite appeared in the air. The power suddenly turns off and all appliances stopped working. Moreover, the motors in the cars didn't work. All citizens of the town crowded together on the street. Two men decided to go downtown on foot. The boy stopped them saying that if aliens had done it, they would not allow anybody to leave the town. The aliens would be like humans: for instance, mother, father, and kids, but they are not really human. Although the town dwellers didn't believe in what the boy had said, they looked precisely at each other. Their doubts were raised after the car of one person started working. One person from the mob remembered that he saw how the owner of this car went out of the house during nighttime and looked to the star. It was a turning point of the teleplay; Rod Serling wanted to show how the group of people turns to a mob. There were other episodes when another and another person became suspected as an alien. The real aliens were shown in the last scene. They said that they didn’t need to use a weapon to defeat of people, the people could do it to each other. This teleplay has a very high rating on imdb.com, 9.0. It gives the audience "food for thought".